Posted on 2, November 2016 by EuropaWire PR Editors | This entry was posted in Entertainment, Media, United Kingdom and tagged Alex Horne, comedians, Competition, Greg Davies, Hugh Dennis, Joe Lycett, Lolly Adefope, Mel Giedroyc, Noel Fielding, Taskmaster. Bookmark the permalink. LONDON, 02-Nov-2016 — /EuropaWire/ — Hugh Dennis, Joe Lycett, Lolly Adefope, Mel Giedroyc and Noel Fielding will compete to be crowned Taskmaster champion in series four of the hit show starring BAFTA-nominated Greg Davies and Foster’s Edinburgh Comedy Award nominee Alex Horne. 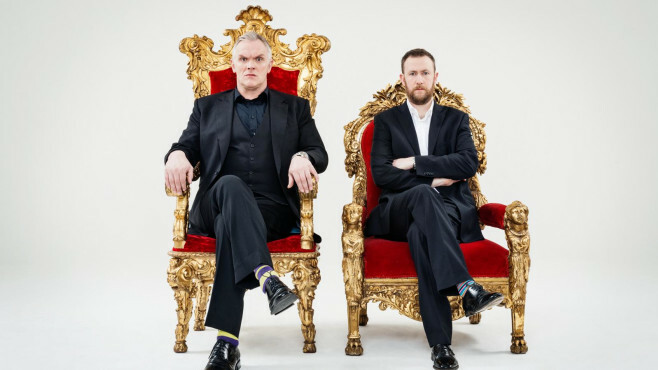 Series four and five of Taskmaster, 2015’s most watched commission on UKTV Play, are scheduled to air in 2017. In each series the Taskmaster and his loyal assistant will judge five new unwitting comedians as they compete against each other with creativity, cunning and genius in a series of stupefying tasks. Series one was won by Josh Widdicombe, and Katherine Ryan took home the series two crown. Series three, starring Al Murray, Dave Gorman, Paul Chowdhry, Rob Beckett and Sara Pascoe is on Dave, Tuesdays at 10pm, so the fate of the current crop of pretenders will soon be decided. An Avalon Television production, series four and five of Taskmaster were commissioned by Hilary Rosen, deputy director of commissioning at UKTV and ordered by Richard Watsham, director of commissioning and Dave general manager, Steve North. Executive producers for the series are Alex Horne (who also devised the show), Richard Allen-Turner, Rob Aslett, James Taylor, Jon Thoday, and Andy Devonshire (The Apprentice and The Great British Bake Off), who also acts as series director, and Hilary Rosen for UKTV. Andy Cartwright is series producer. As well as home-grown delights Dave also goes stateside, cherry-picking cult US Shows including the sharp-witted and sharp-suited Suits and much-loved Parks and Recreation along with Emmy-nominated The Last Man on Earth. This all contributed to Dave’s award win at the 2016 Broadcast Digital Awards for Best Entertainment Channel. Dave is the UK’s most watched non-PSB channel broadcasting to over 27 million people per month, and viewers continue to enjoy the ludicrously addictive American Pickers and UK remake of Storage Hunters. The channel continues to grow its original commissioning slate with political show Unspun With Matt Forde, Red Dwarf XI, Dara O Briain’s Go 8 Bit, fantasy comedy Zapped! and Celebrity Storage Hunters airing later this year. The award-winning independent has eleven imaginative brands – UKTV Play, Dave, W, Gold, Alibi, Yesterday, Drama, Really, Home, Eden and Good Food. These include the two most popular non-PSB channels in the UK and account for 9.31% of the British commercial TV market. The company’s most recent financial results showed record-breaking year-end revenue of £319m and EBITDA of £82m. It invested £148m in programming and related launches last year, and is becoming an increasingly significant investor in UK creativity. Now celebrating its 23rd year at the forefront of digital television, UKTV – an independent commercial joint venture between BBC Worldwide and Scripps Networks Interactive, Inc. (SNI) – is proud to be the only British television broadcaster in The Sunday Times top 100 companies list. Taskmaster is produced in the UK by Avalon Television for UKTV’s Dave. Avalon Television is a completely independently owned production house operating out of New York, Los Angeles and London. Avalon Television are currently in production with: Last Week Tonight with John Oliver (HBO), Not Going Out (BBC One), Catastrophe (Channel 4), Russell Howard’s Stand Up Central (Comedy Central UK), Russell Howard & Mum: USA Road Trip (Comedy Central UK), Man Down (Channel 4), The Chris Ramsey Show (Comedy Central UK), Adam DeVine’s House Party (Comedy Central USA), Unspun With Matt Forde (Dave) and Workaholics (Comedy Central USA).